It has been over 6 years since the beginning of “The Great Recession”. As the stimulus vs. austerity debate rages on, it is worthwhile to evaluate the efficacy of these competing economic ideologies, as they are essentially up for referendum in the 2014 U.S. midterm elections. It is almost impossible to find truly neutral economic analysis; there are experts and spin-doctors across the political spectrum, people whose jobs are to cherry-pick facts and provide anecdotes to vindicate their positions. I try my best to be objective, but I am sure that my progressive biases are evident to my readers. One thing that cannot be faked, at least in modern democracies, is macroeconomic history (thanks to advances in data collection, government budgetary transparency / accountability and communications technologies). So what have the past 6 years taught us? On one hand, the doctrine of “expansionary austerity” relies on “magic asterisks“–the math doesn’t add up. This is not just a liberal claim, it is backed up by the [absence of] economic growth in countries and states that have tried / been force-fed the bitter pill of “expansionary austerity”. On the other hand, robust, cross-country analyses of post-Great Recession economic policies, carried out by the IMF, have [slowly] acknowledged the damage caused by austerity / benefits of stimulus spending (and this is the IMF here, not exactly a pro-poor institution). At the state level, Republican governors — and Gov. Sam Brownback of Kansas, in particular — have been going all in on tax cuts despite troubled budgets, with confident assertions that growth will solve all problems. It’s not happening, and in Kansas a rebellion by moderates may deliver the state to Democrats. But the true believers show no sign of wavering. …the nature of the budget debate means that Republican leaders need to believe in the ways of magic. For years people like Mr. Ryan have posed as champions of fiscal discipline even while advocating huge tax cuts for wealthy individuals and corporations. They have also called for savage cuts in aid to the poor, but these have never been big enough to offset the revenue loss. So how can they make things add up? The International Monetary Fund, showing heightened concern over a slowing world economy, said on Tuesday that cash-rich countries like Germany needed to step up large public investments to help keep the flagging global recovery on track. Its estimate for United States growth in 2015, 3.1 percent, outpaces all major industrialized countries and exceeds as well a number of emerging markets, which in theory are supposed to grow at a substantially more rapid clip. The fund unveiled this week a paper arguing that large-scale infrastructure investments, if properly undertaken, could bring relatively quick growth benefits — a message that seemed to be directed at deficit-obsessed eurozone governments, including Germany. “Infrastructure investment, even if debt-financed, may well be justified,” Olivier Blanchard, the fund’s senior economist, said at the news conference on Tuesday. Mr. Blanchard pointed out that with interest rates at modern-day lows — Germany can borrow money for 10 years at below 1 percent — taking on extra debt to stimulate the economy need not be seen as profligacy. Mr. Blanchard, who oversees economic research at the I.M.F., was behind the fund’s public recognition two years ago that heavy-handed austerity policies in Europe had a larger-than-expected impact on economic growth. Now, it seems, the global watchdog seems to be going one step further by urging eurozone officials to relax their rigid austerity measures. 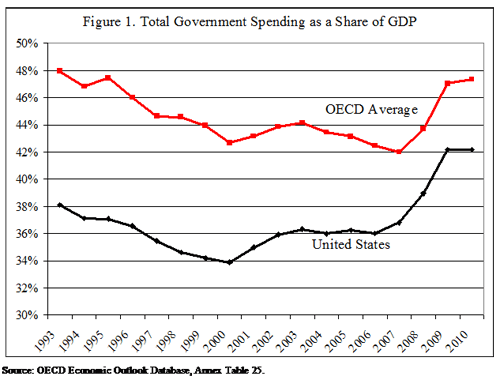 In America, those who oppose stimulus spending–fiscal conservatives–also tend to believe in “American Exceptionalism”. What happens in other countries is not relevant to America; “we’re special”, they claim. These same opponents of stimulus spending may also argue (with negative connotation) that “the U.S. is turning into Europe”. However, as you can see from the graphs at the top of the post, the U.S. has far lower spending and unemployment rates than other wealthy economies. The great irony, which I am sure is lost on those who worry about the “eurofication” of America, is that it was in large part our ability to pursue policies that they would consider “European” (the ARRA, QE), that enabled the U.S. to lead the global economic recovery. I too believe in “American Exceptionalism”. To me, however, this exceptionalism is more about the extra-territorial obligations that come with being the world’s strongest economy, military, and reserve currency, than an heir of hubris which precludes considering the experiences of other countries when drafting policy. But that’s just my opinion. The issue of debt sustainability, however, is far less subjective. America’s relatively high growth rates, and historically low interest rates (thanks to central bank independence and a sterling history of honoring our debts), make stimulus spending both feasible and fiscally responsible. I am not fully sold on the merits of Modern Monetary Theory (MMT), it seems too radical to me. I am, however, a proponent of context sensitive macroeconomics; expansionary fiscal policy (stimulus spending) is appropriate now, but may not always be. However, the temporal nature of democratic politics makes offering future deficit reductions in exchange for stimulus spending, impracticable (which is unfortunate, as this approach is just what the doctor ordered). Government spending need not take the form of “paying people to dig holes and then refill them”, a picture anti-government proponents love to paint. There are glaring infrastructure weaknesses that pose serious problems from both public safety and economic perspectives. Furthermore, in the current context, government spending would not “crowd out” private investment. In fact, if properly enacted, stimulus spending should increase private spending. Governments around the world are increasingly embracing public private partnerships (PPP)–leveraging public money to raise private funds when it serves both sectors interests (such as infrastructure spending, job training, etc). Corporate cash hording, despite very low interest rates, suggests that private companies are able and would be willing to spend more if either a) the government contributes funding (PPP), or b) aggregate demand increased (which in the short run can be catalyzed either by increasing government spending, or by putting more money in the hands of those with the highest marginal propensity to consume–poorer people). Of course, there are limits to what stimulus spending can achieve. The “multiplier” effect of a stimulus program depends on the necessity, targetability, efficiency, and accountability of its components. Beyond government spending, major policy changes, such as tax reform and minimum wage increases, are also desperately needed. Liberal economic policies in the U.S. cannot fix the world’s problems, but they can increase American growth, set our economy up for higher future growth rates, and rekindle “The American Dream”. The U.S can lead both by action and example, serving as a model for other countries to emulate as best they can. Categories: Blog Posts, Economic Outlook | Tags: Austerity, conservative, Debt sustainability, Great Recession, liberal, midterm elections, military-industrial complex, public-private partnership, Stimulus | Permalink. The earliest use of the actual term “starving the beast” to refer to the political-fiscal strategy (as opposed to its conceptual premise) was in a Wall Street Journal article in 1985 where the reporter quoted an unnamed Reagan staffer. Historian [Economist] Bruce Bartlett, former domestic policy adviser to President Ronald Reagan, has called Starve the Beast “the most pernicious fiscal doctrine in history”, and blames it for the increase in US government debt since the 1980s. For a historical look at government revenue and expenditure, please see here. The most useful number (IMO), is the % GDP comparisons. The essential argument of MMT is that if growth rates are greater than interest rates, debt is sustainable and a government can run a budget deficit indefinitely (governments, unlike households, do not die). Japan, with its Debt/GDP ratio almost twice as high as the U.S., is a primary example the difference between debt sustainability versus total debt. Many of Europe’s “trouble countries” have trouble with much lower debt / GDP ratios (than Japan); without control of printing money, they are at the mercy of markets to borrow. These markets have been charging troubled countries a higher “risk premium”, pushing these countries into damaging austerity policies in the face of depressed demand. It is not the level of debt, but the interest that needs to be paid on it, that determines debt sustainability in a MMT model. In order to truly starve the beast, it is not enough to deny the U.S. government of tax revenue; the obstructionist must also increase the governments borrowing cost. This is exactly what a debt default would do, lead to higher borrowing costs. In fact, one of the main arguments by liberal economists for stimulus spending–other than the social and economic benefits of employing a substantial portion an idle workers and stimulating demand–is that the cost for doing so is for all intents and purposes the same as if we were running a government surplus! True the Fed can set the interest rate it pays by expanding it’s balance sheet, but this is an extraordinary role for the Fed to use only the most dire liquidity trap, not a viable long-term policy (due to inflationary effects of increasing the money supply when the economy is near or at full capacity). There is certainly no proof that this is specifically anyone’s agenda. However, the same ideologies are behind “starve the beast” policies are behind holding the debt-limit hostage for fiscal concessions. We have to at least question the motives of these politicians; they are “rational” people, and until now I have heard no rational reason for such an unprecedented default. If the goal is to convince their opponents, who are likely to have Post-Keynesian if not MMT views of political economy, that certain policies are unsustainable, a default is–an irreversible way–to achieve such goals. As the self-proclaimed party of fiscal responsibility, the GOP is leading America down the road of ballooning interest payments. Interest payments already make up a substantial portion of total expenditure (8% and growing, twice as much as the federal government spends on education). A default would cause these payments to be substantially bigger, further constricting fiscal space for important social programs. We wouldn’t be getting more for less, or even the same for the same amount, we would receive less services for the same levels of expenditure. It is not fiscally responsible, but then again “starve the beast” and their contemporary “Tea Party” advocates were never really about fiscal responsibility. Furthermore, follow a debt default the ensuing global recession would greatly raise the unemployment rate, driving up the spending on “automatic stabilizer” welfare programs that would otherwise be trending downwards in tandem with a growing economy. You may say that no elected official would ever act so heinously and against the interests of the government and the American people; I would say read up on the history of the “starve the beast” political philosophy. It should also be noted that a default does not actually need to pass in order to result in higher borrowing costs / lower growth (making borrowing unsustainable based on a MMT framework); the specter of a default is enough to achieve these goals (the next debt-limit debate is set for February 2014). Categories: Blog Posts, Economic Outlook | Tags: Austerity, borrowing cost, debt limit, Debt sustainability, default, deficit, GOP, MMT, modern monetary theory, starve the beast, tax cut | Permalink. The primary function of taxation is to collect revenue to pay for public goods and services. Public goods and services are non-rival and non-excludable, they therefore often suffer from a “free-rider problem” (people benefit from the positive externalities regardless of whether they pay into the cost of the good or not). It is because of this free-rider problem that the private sector cannot efficiently provide public goods, necessitating what is sometimes referred to as the “social contract” between people and their governments (I will give up something, in this case money via taxation, in order to have certain publicly provided provisions). Examples of public goods are basic infrastructure (such as roads), and public services (such as police officers, firefighters, and public school teachers). Taxes can also be used for legitimizing purposes. Every modern country has tax collection and income monitoring services (performing similar functions as the IRS in America). One of the major functions of these organizations is ensuring that everyone pays what they are supposed to. A secondary function is to provide legitimacy to ones income; if someone claims large amounts of money with a questionable source, it will raise a red flag, and an investigation will ensue (if the system is working properly). Taxes can also be used to influence ones behavior. The tax on cigarettes in NY is a good example of this. While the government cannot stop people from smoking, they can make it prohibitively expensive to smoke in hopes that people pursue healthier activities. These are just some of the general functions of taxation. As we know here at NN, not everyone plays by the rules, particularly when it comes to taxation. Offshore banking is a huge problem, perpetuating income inequality, human rights abuses, and robbing governments of resources to fulfill their obligations. Some countries systematically provide rock-bottom tax rates and legitimacy for depositors without properly vetting the source of their money, leading to destabilizing financial inflows that dwarf the countries annual output (Cyprus is the most recent example you may remember). As governments face difficult choices in the wake of the Great Recession, it has become more and more obvious that greater coordination and accountability are needed between countries to ensure that the world’s wealthiest pay their fair share for the public goods and services that have helped them to amass their wealth (and are held accountable for their role in the Great Recession). The silver-lining of the Great Recession is that much more focus has been put on destabilizing forces that have accompanied financial globalization (and more recently technological advances which have made high speed / arbitrage seeking investment all the more possible). One example of this is the breaking of secrecy by Swiss Banks. Swiss Accounts are arguably the most famous example of elite tax-evasion; their exposure serves as a symbolic as well as practical turning point in offshore banking history. Another example is the imposition of a financial transaction tax (FTT), even if it has been watered down for now. “The Swiss government said on Wednesday that it would allow its banks to disclose information on American clients with hidden accounts, a watershed move intended to help resolve a long-running dispute with the United States over tax evasion. The decision, which comes amid widening scrutiny in Europe of tax havens, is a turning point in what has been an escalating conflict between Switzerland and the United States. “Ms. Widmer-Schlumpf declined to say how much banks might have to pay. But she said the Swiss government would not make any payments as part of the agreement. Sources briefed on the matter say the total fines could eventually total $7 billion to $10 billion, and that to ease any financial pressure on the banks, the Swiss government might advance the sums and then seek reimbursement. “It is important for us to be able to let the past be the past,” Ms. Widmer-Schlumpf said at a news briefing in Bern, Switzerland. She declined to give any details about the program, but said banks would have one year to decide whether to accept the American offer. It seems Switzerland wants to shed it’s stigma of an off-shore tax haven, and move forward with a more sustainable and transparent financial sector. Financial Transaction Tax: It is no secret that irresponsible lending practices perpetuated financial bubbles around the world which eventually led to the Great Recession. One way of holding financial institutions responsible for their role in the Great Recession, while also raising revenue governments desperately need, is a financial transaction tax (FTT). CESR is a great resource for background info on the financial sectors role and human rights implication of The Great Recession, as well as the FTT. “European countries planning a tax on financial transactions are set to drastically scale back the levy, cutting the charge by as much as 90 percent and delaying its full roll-out for years, in what would be a major victory for banks. “The tax may now also be introduced more gradually: rather than applying to trades in stocks, bonds and some derivatives from 2014, it may apply next year only to shares. Bond trades would not be taxed for two years and derivatives even later. I agree with Italy and France on this issue. The main reason many Euro countries are facing such crippling austerity is due to a “sovereign debt crisis“. These countries cannot afford to borrow sustainably, forcing them to make painful cuts which have led to a double-dip recession and high unemployment throughout Europe. The FTT could potentially add to the borrow costs governments face if it included bonds as well. If however, a tax included everything except bonds, it would have the effect of lowering government borrowing costs. Making other financial transactions more expensive would make bond purchases more profitable by comparison (assuming financial institutions will pass on some portion of the tax to the customer, which is a pretty safe assumption). While the difference would be marginal, even a marginal decrease in borrowing costs can unlock millions if not billions in government resources. What we see is the international community slowly working to make financial globalization more accountable and sustainable. While we may be frustrated with the slow rate of progress (as the author of the NYT article clearly is), it is important to realize that we are making meaningful progress. Despite the political and economic cynics out there, who in their great “wisdom” will tell you nothing is happening to hold powerful interests accountable for their role in the financial crisis, we have as a global community learned lessons (albeit incredibly hard learned lessons) and are taking steps to ensure we do not repeat our past mistakes. Categories: Blog Posts, Economic Outlook | Tags: Austerity, Banking in Switzerland, Cyprus, Debt sustainability, European Debt Crisis, Eveline Widmer-Schlumpf, financial transaction tax, FTT, Great Recession, Human Rights, Internal Revenue Service, offshore trading, social mobility, sustainability, Swiss government, Switzerland, tax evasion, United States, Widmer-Schlumpf | Permalink.